I have a huge soft spot for Slaughterday. Ostensibly no different to any number of other old-school death metal bands, there’s just something hard to define about them that I just really enjoy, (check out Nightmare Vortex, Ravenous, and Laws of the Occult to see what I mean). Here we get 28 minutes of material, comprising four new songs and two cover versions, (Trouble and Amorphis). Ahh, it’s great to hear some new stuff from Slaughterday. Their timeless brand of classic death metal has been missed in its, (relatively brief), absence. With macabre atmosphere and driving riffs, the new songs they have presented on this EP hit the spot nicely. Reliably old-school, but without sounding stale or done-to-death, the tracks we have here are as enjoyable as ever. The original tracks on this EP take from different eras, countries, and styles of old-school death metal, working these in with the indefinable Slaughterday special ingredient to produce quality songs that destroy the opposition with extreme force. I like that the songs have different feels to them. Abattoir has a distinct Vader vibe about it and is a very aggressive opener for the EP. Wasteland in Demise sees the band channel their inner Bolt Thrower a bit more, at least for a chunk of the song. We then get the first cover, Victim of the Insane by Trouble, which has been given the full Slaughterday treatment quite nicely. Phantasmal Death sees the band alternate between slow and fast sections. Parts of the song are crushingly heavy, with some quality morbid atmosphere created by eerie leads, while others are fast, classic death metal parts that are catchier and more memorable than you might initially think. There’s also a killer solo near the middle of the song. This is probably my favourite track on the EP overall. The final new song is Cursed by the Dead, which is full of beefy riffs, punishing groove, and aggressive energy. The singer’s voice sounds extra deep and brutal on this one too, for some reason. Very nice. The EP closes with an Amorphis cover, (Grails Mysteries), which finishes us off well. Of course, each of the above tracks have their own idiosyncracies and personalities, and the bands referenced are only starting points for the songs. Slaughterday are Slaughterday, after all, not anyone else. Once again Slaughterday have delivered the goods. I very much enjoyed this, and look forward to hopefully hearing more new material in the not too distant future. 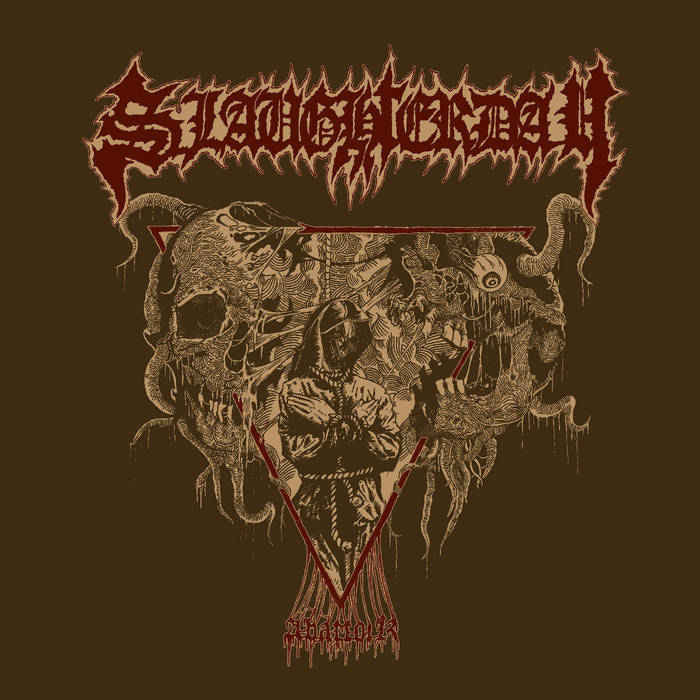 This entry was posted in Death Metal and tagged Amorphis, Bolt Thrower, Classic Death Metal, Metal Death Metal, Old-School Death Metal, Slaughterday, Trouble, Vader. Bookmark the permalink.